Please read the Rule Book carefully before posting. This is the Forum for rules and guidelines. Read all of these before posting in the Dark Knights' Forum. 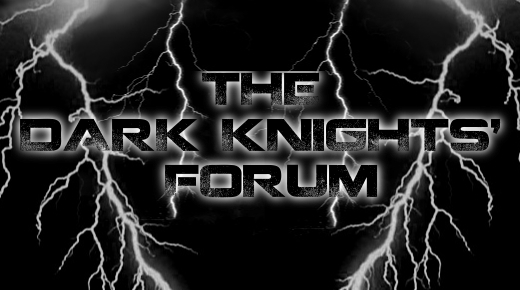 This forum is entirely for General discussion, and new ideas, of the Dark Knights. If you wish to post a suggestion, or just talk about the clan itself, this is the place. Have fun, and keep it clean! This is where you may post all your Dragonfable-related topics and such. Remember, all rules still apply here. Have a question? Ask it here and the Admins, MODs, and Members will be there to answer your questions. Moderated by Rocky Felarian and Dart Ichimonji. Have a question about what you can and can't do in the Q&A Section? Here you will find out anything and everything you need to know. This place is not for posting Questions. Meet The High Knights. Ask questions and your selected Lord/High Knight will answer them. Only Lord and High Knights are allowed to create a MtHK Thread. Are you a signature maker? Can you draw really well? Do you have any artwork you feel like showing off? This is the place to put all of your art work. Currently there is no Clan Artiste. This is were you can put up all the music orbs and the music you have recorded onto them and fellow knights can comment on it. Make sure the music you post is appropriate and that it uses sites like 'Youtuberepeat' or 'Quietube,' instead of Youtube. This is the place to put your long held artwork. Whether it be hand-drawn, flashed, sigs, banners, etc., you can put them here to be viewed and commented on by the other forumites. This is the Forum where young scribes will book their stories. Only the creator of the topic, and story, may post in his topic. Any post that is not in your own topic will be deleted, and a short ban will be placed upon said person. Please keep this Library clean, and have fun scribbling away! This is where you can discuss your story with everyone else on the forum. The same rules as in the Library do not apply. A place for the poets of the clan to make and post their work. Enjoy, and keep it clean. Here you can speak about what ever topic you wish, as well as take part in a few games.